Cystic fibrosis (CF) is a genetically inherited autosomal-recessive disease, resulting from mutations to the CF transmembrane conductance regulator (CFTR) protein, located on the long arm of chromosome 7. It is a multisystem disease typified by chronic respiratory tract infection, leading to bronchiectasis and end-stage lung disease. Only a few CF cases in Taiwan have been published.,, We report the first CF case diagnosed in infancy with complete laboratory and molecular tests in Taiwan IRB No. 1-107-05-013. Consent form is not obligatory for patient whose history has been more than 3 years. A full-term male infant was born after a normal pregnancy and vaginal delivery (gestational age: 39 weeks, G2P2; birth weight: 2965 g). At 1 month of age, the infant had Escherichia More Details coli and Enterococcus faecalis urinary tract infection. Then, at 2.5 months, he was hospitalized because of a cough for 1 week duration. Physical examination showed a failure to thrive; his body height (55 cm), body weight (3.96 kg), and head circumference (37 cm) were less than the third percentile on the normal growth curve. He had pitting edema in his extremities, skin desquamation with erythematous change [Figure 1], and copious greenish, loose stool. Pneumonia, a urinary tract infection, and a yeast infection were suspected, and he received empiric antibiotics and antifungal agents with ampicillin, gentamicin, and fluconazole. Urinary cultures grew E. coli and E. faecalis; sputum culture grew Candida albicans. Urine cytomegalovirus polymerase chain reaction also showed positive. He also had normocytic anemia (Hb = 7.2 g/dL, mean corpuscular volume = 82.8 fL), hypoalbuminemia (albumin = 2.0 g/dL), and hyponatremia (Na = 130 mmol/L). He received a blood transfusion and albumin supplementation. A dermatologist was consulted, and then, pityriasis alba, reactive dermatitis, and zinc deficiency were suspected. Due to his clinical features including recurrent infection and failure to thrive, we suspected that he might have immunodeficiency or CF. A series of immunologic study was applied which revealed normal finding (C3 = 45.7 mg/dL, C4 = 17.8 mg/Dl, IgG = 381 mg/dL, IgM = 34 mg/dL, IgA = 20 mg/dL). He was given pancreatic enzymes, vitamin supplements, and a zinc supplement. After treatment, the skin rash and stool improved significantly [Figure 1]. A sweat chloride test showed high chloride concentrations (110 mmol/L and 160 mmol/L at 4 and 4.5 months of age, respectively). A DNA analysis was performed and a homozygous nonsense mutation c.923C>A (p.S308X) and a homozygous variable-site mutationb c.1408G>A (p.V470M) (NCBI: SNP rs213950) in the CFTR gene were identified [Figure 2], confirming CF. CF is a major, severe, chronic lung disease in White populations but is rare in Asian populations, with a reported incidence of <1 in 50,000. Mutations in the CFTR gene leads to an inability to secrete salt and water with excessive reabsorption of salt and water, leading to secretions that obstruct the airways, pancreatic ducts, biliary ducts, and vas deferens. CF is characterized by the classic triad of elevated sweat chloride levels, chronic sinopulmonary disease, and pancreatic insufficiency. In infants, the presentation of CF includes meconium ileus and failure to thrive. About 15% of infants with CF are born with meconium ileus, and of these, 85%–90% develop pancreatic insufficiency in the 1st year of life. Symptoms include steatorrhea and failure to gain weight even with large food intake. Severe, untreated pancreatic insufficiency can present with protein-energy malnutrition, anasarca, hypoproteinemia, electrolyte loss, anemia, and failure to thrive. Nutritional deficiency dermatitis may be present as the initial manifestation of CF. It can present at 2 weeks to 6 months of age due to essential fatty acids, Vitamin E, zinc, and possible taurine and copper deficits. Our infant patient fulfilled the diagnostic criteria for CF. He had elevated sweat chloride combined with symptoms including failure to thrive, protein-energy malnutrition, nutrition deficit disorder, and steatorrhea. The most prevalent mutation of CFTR is deletion of a single phenylalanine residue at amino acid 508. 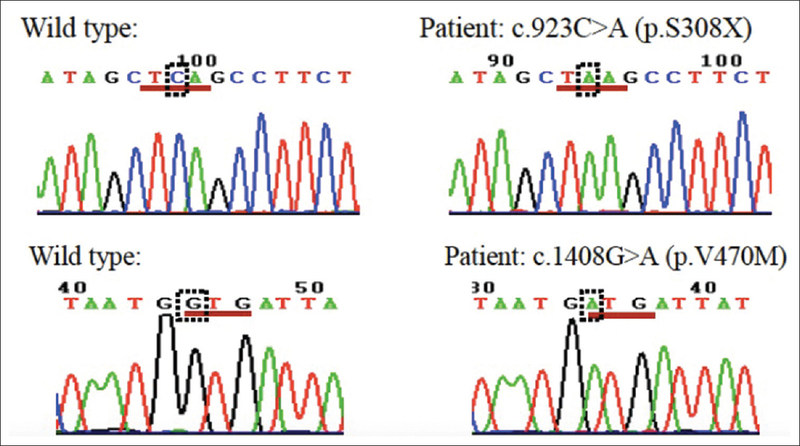 We identified a homozygous nonsense mutation c.923C>A (p.S308X) and a homozygous variable-site mutation c.1408G>A (p.V470M) (NCBI: SNP rs213950) in our infant patient. The c.1408G>A (p.V470M) is a single nucleotide variant on 7q31.2 which does not cause CF when combined with another CF-causing variant based on CFTR2 database. Thus, we believed that p.S308X is a novel mutation that cause CF. 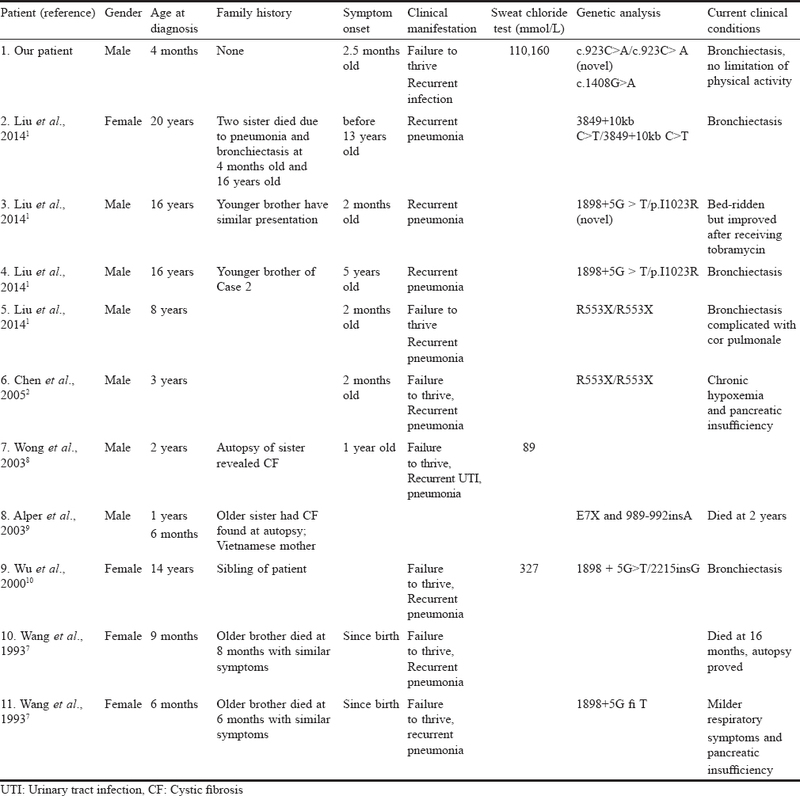 Similar clinical presentations have also been noted in these patients reported in Taiwan [Table 1] who had the onset of symptoms in infancy and died at an early age. Only two Taiwanese cases of CF diagnosed in infancy have been reported in the medical literature. Clinical presentations of these two infants showed recurrent pneumonia and poor weight gain. One infant died at 16 months of age; autopsy revealed mucus-plugged, dilated exocrine ducts in the pancreas. CF patients reported in Taiwan have diverse novel CFTR mutations [Table 1]. This finding means the absolute number of carriers is in the millions. The incidence of CF in Taiwan may in fact be higher than expected. The delay in diagnosis of CF could have been due to the belief that in Taiwan, it is not necessary to include CF in the differential diagnoses of failure to thrive. A high index of clinical suspicion is mandatory for early detection and prompt treatment of infantile CF. In infants with failure to thrive and recurrent pulmonary infections, we should always include CF in the differential diagnosis. Earlier diagnosis and aggressive treatment are the only ways to improve the prognosis of Asian patients with CF. Liu LC, Shyur SD, Chu SH, Huang LH, Kao YH, Lei WT, et al. Cystic fibrosis: Experience in one institution. J Microbiol Immunol Infect 2014;47:358-61. Chen HJ, Lin SP, Lee HC, Chen CP, Chiu NC, Hung HY, et al. Cystic fibrosis with homozygous R553X mutation in a Taiwanese child. J Hum Genet 2005;50:674-8. Lin CJ, Chang SP, Ke YY, Chiu HY, Tsao LY, Chen M. Phenotype and genotype of two Taiwanese cystic fibrosis siblings and a survey of delta F508 in East Asians. Pediatr Neonatol 2008;49:240-4. Stojković A, Radlović N, Vuletić B, Nestorović B, Leković Z, Obradović S, et al. Presentation of an infant with nutritional deficiency dermatitis as the initial manifestation of cystic fibrosis. Srp Arh Celok Lek 2013;141:810-3. Wenk KS, Higgins KB, Greer KE. Cystic fibrosis presenting with dermatitis. Arch Dermatol 2010;146:171-4. The Clinical and Functional TRanslation of CFTR (CFTR2). US CF Foundation, Johns Hopkins University, The Hospital for Sick Children; 2011. Available from: https://www.cftr2.org. [Last accessed on 2018 Mar 08]. Wang MC, Shu SG, Chang SM, Ho WL, Chi CS. Cystic fibrosis in two Chinese infants in Taiwan. Zhonghua Min Guo Xiao Er Ke Yi Xue Hui Za Zhi 1993;34:314-21. Wong LJ, Alper OM, Wang BT, Lee MH, Lo SY. Two novel null mutations in a Taiwanese cystic fibrosis patient and a survey of East Asian CFTR mutations. Am J Med Genet A 2003;120A: 296-8. Alper OM, Shu SG, Lee MH, Wang BT, Lo SY, Lin KL, et al. Detection of novel CFTR mutations in Taiwanese cystic fibrosis patients. J Formos Med Assoc 2003;102:287-91. Wu CL, Shu SG, Zielenski J, Chiang CD, Tsui LC. Novel cystic fibrosis mutation (2215insG) in two adolescent Taiwanese siblings. J Formos Med Assoc 2000;99:564-7.